Aerospace jobs in Canada are nationwide, meaning there are excellent job opportunities coast-to-coast for graduates of colleges with aviation technician programs. Students interested in manufacturing will largely be based in Quebec and Ontario, which account for 80 per cent of manufacturing (55 per cent and 25 per cent respectfully). For MRO students, Western and Atlantic Canada remain strong, capturing almost 60 per cent of the sector. According to Boeing, global fleet growth will continue to drive a strong demand for technicians to repair and maintain the airplanes. Boeing predicts that North America will need 118,000 new technicians to support airline growth alone. Airplanes are very mobile. While many basic MRO functions have been exported to lower wage countries, Canada remains a global player in higher end and more sophisticated MRO. There are manufacturing opportunities in Western Canada also. For example, Winnipeg is home to Boeing Canada, which operates the country’s third-largest aerospace manufacturing facility (Canada is Boeing’s second-largest international supplier network, working with more than 560 suppliers across the country). There are good jobs available for graduates interested in both fixed wing and rotary aircraft and propulsion systems. Canada ranks in the top three worldwide in terms of civil airplanes (No. 2 in business aircraft production and #3 in regional aircraft), helicopters (No. 3 in helicopter production) and aircraft engines (No.1 in turboprop and helicopter engine production). Canada also ranks fourth worldwide in turbofan production and large jet production. Like other sectors in Canada’s manufacturing industry, aerospace is scrambling to close a skills gap. According to a 2015 labour market report by the Canadian Council for Aviation and Aerospace (CCAA), 83 per cent of Canadian aviation and aerospace companies expect to continue to grow. Another driver for hiring will be retirements. As the Canadian workforce ages, demand for younger workers – and workers with skills to apply to new and emerging technologies in aviation, is expected to also grow. The CCAA study noted an imbalance in skills needed and those that are available, something students should research carefully when selecting an aviation technician program. Boeing notes that as operators continue to take delivery of new airplanes, advances in airplane technology will drive an increased need for technicians skilled in avionics, composites and digital troubleshooting. The British Columbia Institute of Technology (BCIT) School of Transportation is a North American leader in transport training and producing high-quality, job-ready graduates in demand by the aerospace sector. The School of Transportation delivers accredited and globally recognized programs tailored to meet the human capital needs of the transport industry. The school’s aerospace facility is the largest provider of skilled graduates to the aviation industry in British Columbia, and offers accredited programs that prepare graduates for careers as Aircraft Maintenance Engineers (avionics and maintenance), and Gas Turbine/Jet Engine Technicians. The Aerospace Technology Campus is conveniently located at the Vancouver International Airport and features a dramatic 40,000 square foot hangar at the centre for BCIT’s fleet of light piston, turboprop, corporate and jet transport aircraft, and light and medium helicopters. Northern Lights College (NLC) opened in 1975. It is known as B.C.’s Energy College, serving northern British Columbia in an area covering more than 324,000 square kilometres. NLC’s Aerospace Centre of Excellence opened in 1981, at the college’s Dawson Creek Campus. Aspiring students and current aircraft maintenance engineers receive hands-on training in a hangar that houses 13 aircraft, including a Robinson R44, Airbus AS350D and Bell 205 and 206 helicopters, a Cessna 180, Beechcraft King Air, Piper Aztec and British Aerospace Jetstream 31, turboprop airliner. The Southern Alberta Institute of Technology (SAIT) Polytechnic is a member of Polytechnics Canada, a national alliance of leading research-intensive colleges and institutes of technology. SAIT’s School of Transportation, provides hands-on, practical education for the aviation, heavy equipment and rail sectors. The school offers full-time training in aircraft maintenance engineering, aircraft structures and avionics technology. All programs are taught at the state-of-the-art Art Smith Aero Centre for Training and Technology, located at the Calgary Airport. The Saskatchewan Indian Institute of Technologies (SIIT) was created in response to the need for quality, post-secondary education for First Nations people. The Saskatchewan Aviation Learning Centre at Saskatoon’s Diefenbaker International Airport is a joint effort of SIIT, the government of Canada, province of Saskatchewan and the Saskatoon Airport Authority. The SIIT Aircraft Maintenance Engineer program is open to First Nation and non-First Nation students, and delivers the knowledge and skills required for eligibility to apply as an apprentice in the aircraft maintenance industry. Graduates are credited with 18 months toward the current four-year industry requirement to obtain a licence. Red River College (RRC) offers training in all aspects of the aviation and aerospace sector. RRC’s Aircraft Maintenance Engineer program is designed to develop the knowledge and skills in maintenance of both large and small airplanes and helicopters. This program has been accredited by the Canadian Forces for their Non-Commissioned Member Subsidized Education Plan. RDC also offers programs for careers as an Aircraft Structures Technician, Aircraft Gas Turbine Engine Repair and Overhaul Technician. Algonquin College’s School of Advanced Technology of a broad range of programs including Transportation Technology departments. Programs are created with the needs of industry sectors in mind, with skills that are transferable around the world. The Aircraft Maintenance Technician program teaches students the knowledge and skills required to equip themselves for work in the aircraft maintenance industry. Canadore has been a leader in aviation training for more than 40 years. The School of Aviation is a dedicated aviation training facility and courses are delivered at the college’s Aviation Campus at Jack Garland Airport. The campus includes prime training space, and is filled to capacity with fixed and rotary wing aircraft for students to work hands-on. A New Advanced Composites, Fabrication, Repair and Test Centre is a recent addition to the campus and supports innovative technologies, applied research, materials testing opportunities and customized training programs. The college offers three basic training programs; the Aircraft Maintenance (AMT) and the Avionics Maintenance (AVN) program, and a Structural Repair (ASR) Technician program. In addition there are advanced aviation technology programs. Centennial College’s School of Transportation is Canada’s transport training hub. The faculty are among the most highly skilled in the industry, and training equipment is state-of-the-art, including a fully equipped hangar for aerospace and avionics students. Programs are supported and reviewed by industry representatives to ensure they are of the highest quality. Aircraft Maintenance and Avionics Maintenance are the two Aviation Technician programs offered within the school. The Aviation Technician – Aircraft Maintenance program is for students who are more interested in the airplane than the trip. It provides the opportunity to master mechanical, electrical, electronic and other science skills related to aircraft maintenance. The program emphasizes the repair of electrical and mechanical systems within the aircraft. Students will study hydraulics, fuels, environmental systems, engines, flight controls, landing gear system and airframes and structure. The Aviation Technician – Avionics Maintenance program provides students with the knowledge and skills to launch a career as an aircraft maintenance technician in avionics, which covers a wide-range of the aviation and aerospace sectors that work together to keep aircraft safe and airworthy. A large portion of this program focuses on aviation maintenance practices, procedures and Canadian aviation regulation requirements through hands-on practice in labs. Avionics Maintenance courses are designed to teach students how to perform tasks and activities associated with the maintenance and repair of aircraft communications, navigation and data systems, and inspection and troubleshooting of basic electronics circuits to sophisticated avionics systems found in modern aircraft. In this program, a significant portion of time is spent on practical applications in labs. Training focused on the aircraft’s various electronic systems – electrical power distribution and control, navigation, flight instrumentation, communication and radar. Students are also prepared to be a bench technician for avionic-approved shops and aircraft manufacturing companies. The course material is very technical and comprehensive, and to achieve success, students should be prepared to invest extra time on study, mandatory project completion and exam preparation. Centennial College’s Ashontbee Campus’ airplane hangar provides a learning environment that conforms to industry standards. Students will learn about routine maintenance, servicing, inspection, diagnostics and repair, as well as performing flight-line duties. In the fall of 2018, Centennial College will open its Centre for Aerospace and Aviation, now under construction at Toronto’s Downsview Park. The project includes a hangar, which is large enough to accommodate today’s commercial jets, as well as new classrooms, laboratory space, workshops, offices, a library and, for the first time, access to working runways. Confederation College offers several aerospace and aviation technician courses at its Aviation Centre of Excellence (ACE) at Thunder Bay International Airport, Ontario’s third busiest. For example, Students learn about composites and how these materials make a difference in flight. Programs were developed in partnership with some of Canada’s leading aerospace companies including Bombardier and Magellan, and ACE has a sizeable fleet of non-flying aircraft for students to work on. Fanshawe College | London, Ont. Fanshawe College is one of the largest colleges in Ontario. The school’s Aviation Technician – Avionic Maintenance program covers all aspects of aircraft avionics systems used in general aviation, corporate, charter transport category aircraft and helicopters. The course provides students with the knowledge and skills needed for servicing, repair and maintenance of aircraft electrical and electronics systems. St. Clair College | Windsor, Ont. 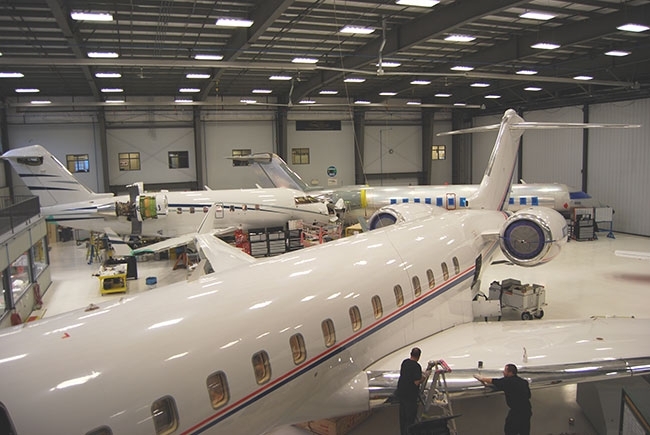 St. Clair College delivers a customized training program to train aircraft maintenance and repair workers in partnership with Quebec-based Premier Aviation at its Windsor maintenance, repair and overhaul (MRO) facility. The course will future classroom and hands-on study. Premier Aviation’s Windsor MRO facility is capable of handling all types of aircraft, including the Boeing 747. Nova Scotia Community College | Dartmouth, N.S. The Nova Scotia Community College’s (NSCC) Aviation Institute provides students with the opportunity to build their skills using the latest technology, and to apply learning to real aircraft. The Aviation Institute is housed in a modern, 43,000 square-foot training facility. Students will learn from faculty who bring a passion for their work, valued experience and strong industry connections. NSCC offers three aircraft maintenance engineer programs at the Aviation Institute; structures, mechanical and avionics. Holland College | Summerside, P.E.I. The Holland College Aircraft Gas Turbine Engine Repair and Overhaul Technology program works closely with PEI’s growing aerospace industry. In this 10-month program, students will learn the techniques, procedures and the documentation requirements necessary to perform the disassembly, inspection, repair, reassembly and testing of the turbine engines used to power today’s aircraft. The program consists of approximately 60 per cent practical and 40 per cent theory. Hands-on, practical training is carried out on a variety of turbine engines. College of the North Atlantic | Gander, N.L.